Why did I join up? From a very early age, I knew where my destiny lay. When I say early, I mean during the war; I can still recall at kindergarten a teacher asking us whether we knew the identity of an aircraft flying overhead. I told her that it was a Beaufighter, though I think I might have had problems in the pronunciation. Living on the Isle of Wight, aircraft usually over flew as we were not a prime target and there was a predominance of Fleet Air Arm aircraft due to the proximity of Portsmouth; Fireflies and Fulmars in particular. Later, American counterparts seconded to us, on this 'lend lease' thing I imagine. I recall looking across the valley that my home town Ryde was situated in, and watching a low flying JU 88 drop a parachute. This puzzled me greatly, what on earth for? As it was heading in the general direction of the Hospital which stood out on the skyline, I wondered if it was an injured crew member, but how on earth did they know that? Equally puzzling, how did he avoid landing on a roof? (I could not have been much older than 4 or 5.) Fifty years or so later, I remember returning to the Island and standing in that self-same place and the memory came back - suddenly I knew what was on the end of the parachute, it was a mine! It landed on an infants' school. So why did I join up? Aircraft were in my blood! I went through all the early preparatory stages like building model aircraft and the ATC and remember being miffed when an older brother joined the Apprentices. (He had shown no previous interest in the RAF at all.) He was a member of the 63rd, a summer entry like the 81st, so maybe it was all predestined. He died, as it happens, just two months ago; he got commissioned after Halton and became a pilot. He finished up on C130s and then became a commercial airline pilot. I notified the 63rd's web page and got a response, there is only a handful of them left. Not surprising, I'm 80 and he was 5 years older than me. Early Spring 1955, morning assembly at Bridport Grammar School; Senior boys always sat at the back where we could doze happily. Next to me is Keith Ellis (went into the 82nd) who has a pamphlet with a picture of a youth in a blue uniform looking back over his right shoulder and pointing at the words R.A.F Apprentice! As the assembly was as usual of little interest I asked to have a borrow. Looks a good idea I thinks, so at morning break I skived off home to ask Father what he thought. Brilliant idea he said, get him off my hands he thought. So I filled in the application form, got the head to sign it and thus in the course of two hours my whole life was sorted. The rest is history. Before I start, it is easy to see why the entry is so good, we all come from The Garden Of England, Kent !!! Although most seem to be Kentish Men not stalwart Men Of Kent like what I am!!! I like starting with controversy and look forward to the replies. Born in a nursing home in Willesboro, Ashford, Kent 01/03/1939, in like a lion etc. then moved out to South Ashford for the next 16 years. I was still in nappies, as we all were, when the little black dots came flying over dropping their nice fireworks on us. It got so bad, my mother tells me, I was farmed out to Banbury Cross for a while. On returning I found my father had joined up, The Royal West Kents, and was on the guns at Chelsea embankment where he spent some time trying to delete the black dots (first reason for not wanting to fly). He informed me later the shells only reached 11,000 ft. and the dots flew at 12,000 ft. but the noise kept the locals happy. I moved on after primary school to Canterbury Technical College for engineering tutoring and went to A.T.C. a couple of nights a week; it was run by my grandfather (mother's side). They had a good old Linc Trainer, it never worked, and a few trips - introduction to aircraft, with a load of aircraft spotting, which I really enjoyed; so much so I took the silhouettes on the train to Canterbury and ran a weekly quiz. That was until girls came along. (I digress). As some have already stated, careers people came round, sat me down, went through the list slowly and came to Halton Apprenticeship, mentioned the aircraft training (forgot to say anything about the further three years schooling). I was then hooked, took the exams, came top in the school (I was the only one) and the rest is history. I was ill on the original date so arrived days later, had an interview with a Squadron Leader, who said I would be an Armourer which went against the grain, as I wanted to be Engines (I have no idea why), so I spoke up and stated my preference; surprisingly he shuffled his papers and said "Okay". So finally, reason for joining the R.A.F., little black dots, the A.T.C. and sticking to my guns. Reason for not wanting to fly, somebody else sticking to their guns. THE MAIN AND ONLY REASON I ENLISTED WAS THERE WAS NOTHING FOR YOUNG PERSONS ON THE ISLE OF MAN FOR WORK. WE ALL HAD TO GO AWAY TO MAINLAND BRITAIN. ALL MY FRIENDS ENLISTED INTO THE ARMED FORCES. I THINK WE JUST MISSED NATIONAL SERVICE CALLUP. MY HEADMASTER ENCOURAGED US TO JOIN THE FORCES. I SAW THE APPRENTICE ADVERT IN THE ROVER COMIC AND SENT FOR IT. FROM THERE ON MY HEADMASTER GAVE ME ALL THE HELP AND I STUDIED THE EXAM SYLLABUS THOROUGHLY. WHEN INVITED TO ATTEND FOR ENLISTMENT TO ME IT WAS A DIFFERENT WORLD. JUST BEING IN ENGLAND WAS SO AMAZING. THE ROYAL AIR FORCE TRIED THEIR BEST FOR ME, BUT I ADMIT I DID NOT DO MY BEST FOR THEM. HOWEVER LATER IN MY LIFE ALL THE TRAINING AND CERTAIN SKILLS HAVE HELPED ME. THIS WAS MAINLY DUE TO MY APPRENTICESHIP AND SERVICE. IT IS SO WONDERFUL TO BE ACCEPTED BY PEOPLE LIKE YOU AND THE REST OF THE 81st ENTRY. THANK YOU. I had a flight in a Dragon Rapide at London Airport in the late 1940s and this led to me wanting to fly so I went into the RAF straight from school. My father was a coal miner so any occupation which kept me out of the pits was OK by him. In 1955 I was living in Sittingbourne, and attended Gillingham Technical School which had given me a bit of an insight into things mechanical. A couple of years previously my brother had joined Halton with the 75th Entry so I had a little knowledge of what went on and considering, at the time, the only alternative to employment in Sittingbourne was Kemsley Paper Mill, it didn't take a lot for me to consider the RAF as the place to be. I took the entrance exam at a school in Rainham which must have been successful because I got the call!!! On arrival at Halton my medical discovered I had a certain degree of colour blindness so could not join as an armourer, as I had chosen, so was given the choice of Airfames or Engines. I chose the latter and, as they say, the rest is history!! Reading my mother's journal after she passed I was to discover my very early link with aviation (and motorcycles). Caught in London she was rushed to Queen Charlottes Hospital by motorcycle only to face an air raid warning. Hasty emergency procedures were activated, all the mothers sat in their beds in corridors with heavy china bed pans on their heads, newly arrived children (me) were taken to the cellars. Two factors for me, I was to do something about aircraft and from the cellar the only way was up. Like so many other families all the adults I remember were involved in war time positions, mostly RN, but my uncle was a Spitfire Pilot; Jim and his pilot friends used to visit us with their MGs and motorcycles, couple that with the arrival of the Dan Dare comic (the Eagle), Biggles and the Goon Show establishing a sense of humour I guess the future was set. When decision time arrived we lived on the Isle of Sheppey, expectations of school leavers were limited, the large RN dockyard or a Naval career. I opted to sit for the RAF Apprentice exam, and, like so many others, the rest is history. Reflection on the results of my time as part of the 81st Entry. Yes I could have applied myself more effectively however the often quoted "Halton teaches and prepares you to do absolutely anything with very little" I have been grateful for all of my life and would not change a thing. Trying to remember why I joined the RAF after all these years is making the brain cells work overtime, however a few things come to mind. At school in Hastings in 1953 our lessons during May were constantly interrupted by the aircraft taking part in the rehearsal for the coronation flypast. It seem to take ages for the Meteors, Vampires, Lincolns, Neptunes and others to fly past our school and then turn inland on their way to London. Our teachers sometimes allowed us out in the playground to watch this spectacle, the noise was tremendous and the aircraft absolutely filled the sky, It was this that got me interested in joining the ATC, and from that to joining the Apprentices was a natural progression. My school was a secondary modern and was not known for any academic brilliance, however we had recently welcomed a new headmaster, and I was his first pupil to pass an entrance exam and at assembly he asked the whole school to stand and applaud my achievement. I was quite embarrassed at the time, but now look back on it with fond memories. I still have the enlistment papers and information that was sent to my father, and I wondered if any one else has still got theirs. As a youngster I had always been interested in aircraft and built a few model planes. There was no careers advice at school but occasionally our maths teacher would say "Now boys what you should do is get a job in Local Government". Somehow I did not see 'Angus County Council' as being a suitable home for my restless spirit, I wanted to see what was on the other side of the hill. I was in the Air Training Corps and visited and enjoyed summer camps at RAF Stations and I had flown in an Anson, a Varsity and a Shackleton and got to fire rifles. My mind was made up but I was still at school. 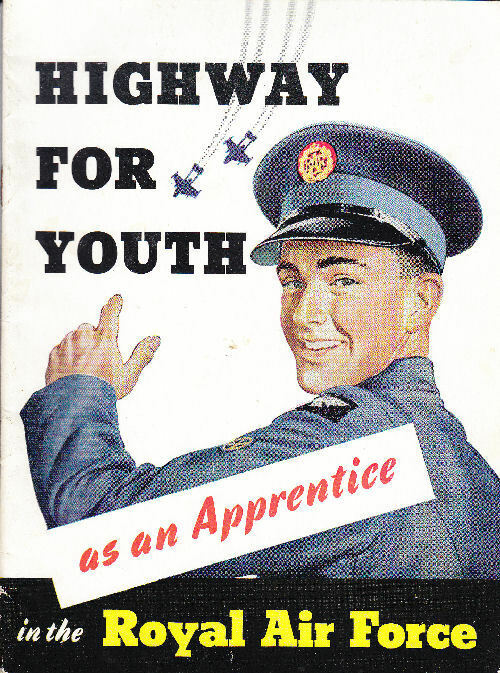 One day, casually listening to the radio around lunchtime, just before the news "Here are the Announcements" and RAF Apprenticeships were described so I sent off for the booklet 'Highway for Youth'. I had not yet taken the final school exams, however I applied, took the entrance exam, passed and was invited to Halton for the medical exam which I also passed and I was in. Shortly after I left school I received a letter telling me to report to the Labour Exchange as it was called in these days. They had found a job for me, beating on the grouse moors. I told them that I was going into the RAF in September so avoided tramping over the heather moors for a few weeks. I lived in Cornwall as a child and was in turn fascinated by the sea gulls hovering in the updraft from the cliffs in front of our house and later by the, at times, endless roar of Merlins from the Coastal Command Lancasters; then later by the Griffon-growl of the Shackeltons from St Mawgan and St Eval across the Bay from Newquay. Add to this the Royal Navy who at that time operated Sea Furys from St Myrren further up the coast so aeroplanes and all-things-that-flew became a prime preoccupation for every boy in my class. At about birthday number 10 I received a Keil Kraft "Ajax" rubber powered free flight model aeroplane and was allowed to watch my Father build it frame by frame and rib by rib. Then the tissue covering and the total mystery and magic of Dope to shrink the whole thing taut and cover a multitude of minor errors. We retreated to the shelter of the Gannel estuatry for test flights. The North Atlantic coast of Newquay`s beaches were normally at gale levels, and were fine for kites but suicidal for the likes of Ajax. The kindly calm Gannel allowed endless hand launched trials to set trims to adjust c of g; rudder tab to counter torque and all sorts of other mystic aspects of aerodynamics which were all as good as Greek to a small boy fighting the mounting tides of boredom. At last Dad declared the time for trials was over and we counted the turns together to 100. There was a pause and Ajax was gently pushed into it's element. Like many septagenerians I might not remember where I was this time last week, but I remember every detail of that and all the other flights af Ajax and all the other rubber and Jetex powered models I built and was still building when I arrived at Halton . The model aircraft led to the ATC and I joined the Newquay Squadron with Peter Conway. I was near the top of the list for a "Shack" flight when we had to move home to Buckingham. My Father, a Scots Guardsman badly wounded in the Norway campaign, had spent over two and a half years in hospital having a leg rebuilt. The Hospital was a wartime use of the Atlantic Hotel which like many other hotels was requisitioned to expand the country`s hospital capacity in safe areas. Employment in Newquay was pretty dire and the move to a job for my Father in Buckingham, close to Halton, was the clincher to applying for Halton along with a new friend, Bob Longhurst, made in the school in Buckingham. Not long after arriving I ran into Peter Conway. Small World isnt`it'? Why did I join the RAF? Well in 1955 I was a country boy in Tewkesbury, Glos, attending the local Grammar School, I was not a brilliant student and my one ambition was to fly in the RAF as a pilot. I was a member of the School ATC Squadron who enjoyed any association with the RAF, particularly vists to local RAF units, e.g. Little Rissington (CFS). I knew that several senior pupils had joined as Cranwell cadets, but their academic achievements had been better than my potential. The ATC boss knew of my ambition to become aircrew and suggested I might join as an Apprentice and volunteer for aircrew duties later. He obtained the various brochures for me and I decided that was the way ahead and, of course, I wouldn't be called for National Service. I enjoyed my career with its ups and downs, probably more ups than downs, and the Pension is good. Why did I want to become an Aircraft Apprentice? I got bitten by the flying bug at a Farnborough Airshow. Also circumstances proscribed that I could not continue at school. I also had a brother in 73 Entry. The item on 'reasons for joining the RAF' got me thinking, and I realised that I have no idea. I had no service background of any kind; I achieved reasonable O-level results and I recall my headmaster contacting my parents to try to get them to convince me to no avail that I should stay on to the 6th form; and although I was in the ATC it was really only because I didn't fancy the Boy Scouts. I have a vague recollection of cycling home from school one sunny day, looking up at the contrail of an aircraft flying overhead and thinking that flying might be nice, but it was only a passing thought. One thing I am sure of though: whatever the reason I have never had any regrets. My reason for joining up with the 81st Entry is rather simple. My elder brother had recently completed a successful 3 year Apprenticeship with the 69th and done very well for himself looking very smart in his uniform and loving every minute of his time in the RAF. If you recall conscription was still a possibility and I didn't want that. I could get home on long weekends (if we had any) with my washing for my Mum to do. My dad thought it was a wonderful opportunity to get rid of a pain in the arse know-it-all. It must have been a family thing because my younger brother also joined the scheme with the 101st Entry completing what must be something of a record all of us being Engine Fitters. Both of my brothers also won the Final prize of The Best Practical Fitter over the Three Year Course. The Young one, bless his cotton socks, was also awarded a commission on graduation. We all went on to enjoy full careers in the RAF and beyond, all thanks to our Halton training. To pick up on Brian's point as to why we 'joined up' I never thought of flying as an end result. I had left school the previous summer with a poor result of three 'O' levels. Not that I deserved any more as I had not worked at all. It was only in the second term at Halton that I was made aware that people swotted up for exams. On leaving school I went to work as a trainee supervisor at a beer bottling plant. It was okay but being a naïve sort, working with a shop floor full of girls of all ages, creeds and sizes was a bit more than I was used to. As weeks went by and there were no moves to send me to night school etc. which all my friends seemed to be going on in their jobs I started to get a bit fed up. In the next couple of years I would have to do my National Service and this also played on my mind. I thought if I am going to go in the services I would like to pick which one I would go into. Also in the early fifties there were Suez and the troubles in Cyprus brewing up. I did not fancy the idea of going in the Army and being shot at. Around that time I saw the adverts for RAF Apprentices. After making enquires I found I had to take a written test at the local Employment office. The thought of having to serve thirteen years as opposed to two or three with National Service never even entered my head. The idea of getting away from the current situation and seeing other parts of the country was about the only incentive. For some reason the only question I can remember from the entrance exam was to say how many football teams were in the First Division. As a youngster I first saw a Spitfire in Princes Street Gardens in Edinburgh. It was a fundraising event, wooden steps allowed people to climb up on side then down the other. A more significant event came when I was playing outside our house on the outskirts of Edinburgh. Three Spitfires came past, flying at (VERY) low level, I could clearly see the pilots! This must have been nearly the end of the war or soon after, made a big impression on me. Next thing that influenced me was my uncle Allan, he was a Corporal Instrument Fitter and had served on a Spitfire squadron in the Battle of Britain, then in northern India on Spitfires flying into Burma against the Japanese. It is not entirely surprising that as soon as I found out about the Air Training Corps, I joined and rose to the dizzy rank of Cadet! From the cadets I learned about the Apprentices at Halton and applied to join. The rest is history, having just squeezed through the entrance exam I opted to become an Instrument Fitter (my uncle's influence) despite the fact that my ATC Squadron had been teaching us mostly about engines. Later in life my Flight Commander asked me why I was not a Flight Sergeant and was surprised to learn that there were fewer opportunities for promotion as an Electrician than there were for Engine fitters. I think that I had already been promoted to my level of incompetence by then anyway! Altogether I served for just short of 30 years in a variety of posts. Starting in the Instrument Bay, Leuchars and finishing as Air Eng 3C1, Harrier Engineering Authority at Rheindahlen in Germany. Altogether 10 stations plus lots of others on detachment, visits, courses and hospital to have a troublesome Gall bladder removed. My dad joined the RAF as an aircraft apprentice in the 18th Entry (1928 to 1931). He left the RAF shortly after the war and set up his own business making grain conveying machinery. It was always assumed that I would eventually take over the business and my dad thought that the best training I could have would be an RAF apprenticeship. As I had grown up playing with Meccano and making model aeroplanes this suited me very well and I never regretted it. Mine was a natural progression from being raised in the aftermath of WW11 in SE London amidst the effects of all the bombing and watching Spitfires and Hurricanes of the RAF during the Battle of Britain. The experience of life inside an air raid shelter during a warning can never be forgotten. My early schooldays with food rationing etc. played it's part in growing up in a harsh environment. I had been very fortunate in that I was evacuated to a distant relative living in Cambridgeshire towards the latter part of the war. During my early days growing up I was able to spend my summer holidays back there to help on the farm driving a tractor, picking the local produce and generally helping with the harvest. A different world compared to London and I became a country boy at heart, later thanks to the RAF I spent a great deal of my service in East Anglia. The village was very close to a local airfield, RAF Oakington, and Vampire jets were operatring nearby. A short bike ride took me to the perimeter fence near some Nissan huts which gave me a closer look. The seed was sown as they say. Just as a bye, Oakington as you can imagine was always at the top of my list of prefered postings ever since leaving Halton including Germany and the Far East but was never to be. Do you remember the advice, never put St Athan, I didn't but still ended up there. My wife will never forgive me! By the time I reached Grammar School I joined the ATC and spent one day a week in 'blue' uniform and had a variety of activities after school hours, aircraft recognition etc. We also had a .22 range on the school roof which appealed to me and summer camps at Biggin Hill, Mount Batten and not forgetting Duxford, my first posting later, with Meteor 8's. My air experience started in an Anson working up to a Sunderland Flying Boat. Our squadron CO was a distinguished veteran Mosquito pilot or was it navigator, I can't remember, douring the war and was highly decorated now teaching English. He never talked about his exploits but I did read about him later in a Flight magazine. Other masters offered their help and experience and given VR commissions, very useful to those of us considering an RAF career bearing in mind qualifications that might be needed. One of our NCO's, a school prefect (gowned i might add) won a scholarship to Cranwell. A good incentive! After taking my GSE's I applied for an Aircraft Apprenticeship and went to Halton for interview and was accepted into the 81st Entry. The rest is history as they say. There was however one drawback, I was found to be colour blind.This precluded my choice of trade. Having had a liking for guns I applied to be an Armourer, I still shoot incidentally having two shotguns and belong to a local clay pigeon club. So that was out, Electrical and Instruments also eliminated leaving Airframes and Engines. As a keen motor bike enthusiast I opted for engines. Alas no places were left but I could try to join the 82nd Entry. Not on your nelly. Thus I became an Airframe fitter and with the benefit of hindsight I did the right thing. Funny how things work out don't you think. I must just add that I made some great friends from the 82nd throughout my service and enjoy meeting them too at Reunions as well as many of our own 81st Entry. My tale ends and my career had begun. I cannot credit my ancestors for prompting my decision: both my grandfathers joined the Army for the First World War, and two uncles joined the regular army between the wars. My father was called up shortly after the Second World War started. He joined the Army as well. During the Second World War I was looked after by my mother's sister and her family. They were a coal-mining family and were thus exempt from military service. So no help there. After the war, one great friend of the family was a lovely fellow called Bill Ratcliffe. He had been in submarines during the first war and was now the skipper of the Souter, one of about a dozen tugs on the River Wear at Sunderland. Because of him I spent a lot of my leisure time messing about on the river learning about tugs and the big ships they used to push about. I got great enjoyment from that. The only connection with aeroplanes was a fleeting one, when the aircraft-carrier HMS Campania, converted as a mobile Festival of Britain exhibition, visited the river in 1951. It couldn't be that, surely? From my earliest years I was always interested in machines. During my last year at school I was interviewed and accepted for an apprenticeship with an engineering firm beside the river. 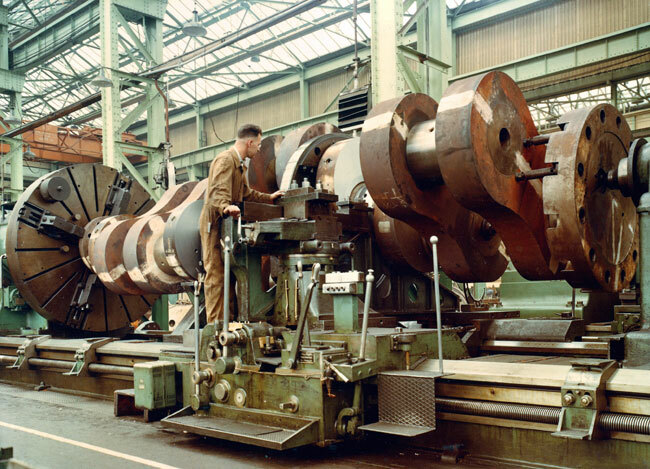 The photo shows a member of that august company doing some precision machining of a crankshaft, for a three-cylinder two-stroke. No, not a Kawasaki, but a Doxford, who incidentally also built ships. I did not take up the apprenticeship because the workforce that I met seemed to lack enthusiasm. So nothing there, either. Could it have been the fact that I was less than a hundred yards away when Halifax LK797 crashed on its return from Nuremburg on 31st March 1944, causing Cyril Barton to be awarded (posthumously) the only Halifax-related VC? It certainly made a big impression on me. Perhaps, but I cannot be sure. Sach Goodwin - 6 Aug 14:. Having taken advice from my father, a career Royal Navy stores and victuals man that since the war there was no future in the RN, being a member of the ATC I decided to have a go at the RAF. At the same time as I joined the 81st, age 15 years and 5 months, my future brother in law joined the RN Tiffies. I passed out as a J/T and he passed out as a PO. By the time I received my Cpl tapes, he was a CPO. No future in the RN? My mother was not one for guns, indeed, I was never allowed a cap gun as a kid, so that is probably why I became an armourer. I retired in 1995 after an enjoyable 39 years and 7 months. Now why did I go to Halton? My Dad was in the RAF ( Catering not Engineering ) we were at Benson. He was then put on a posting to Hong Kong. I was at school in Wallingford and was still to sit my O levels. My options were, Go to Hong Kong take my O levels and work as clerk in one of the forces offices. Go and live with my Grandmother in a run down part of Liverpool. Or try and get accepted for an apprenticeship in the RAF. I had been thinking of a career in engineering but was waiting for exam results before deciding. Talk about rush, I didn't know where I was, I had to take entrance exams the equivalent to the required entrance O levels, aptitude tests, and everything else we had to do before they said you've been accepted for an apprenticeship at No 1 School of Technical Training. Why I joined? I was not in the ATC and had no history of service in the family remember always looking up if a plane passed overhead. According to my Mother one Saturday I flew back indoors and said I am going to join the RAF. Reason Father had driven of without me on the normal Saturday Squirrel shoot ( 1shilling or cartridges given by Government for squirrel tail) I had forgotten my knife and went back for it and the old bugger drove off. That's all I can recall on that subject. Why an AA well the boy next door cousin was in the 70th and he gave me a talk on Halton so I applied took the exam an found myself IN. One question I remember in the exam was describe the inside of a bird, I had spent many times watching mother gut chickens so that one was easy maybe how I past it. With regards to why I joined also having a service childhood in places like Gibraltar, Trieste, Hong Kong and Singapore I really wanted to join the Merchant Navy with Shell Oil but Parents would not sign papers so the Air Force won over the Army. I had always wanted to work on aircraft engines after reading in the adventure magazines about ground crew. I made a lot of model aircraft and I was 16 taking GCE wondering what to do at the end of summer term with the spectre of National Service in the offing. I could have gone to Westlands but the fact that I had an Aunt and Uncle living close to Aylesbury made the decision easy, I also was impressed with the sports available at Halton. In late 1945, possibly 1946, when I was about 7 years of age, I was playing in my father's garden at home. We lived in an end council house which my family had fairly recently moved into. My parents had wanted it because it gave my father a double garden, this being the strip that ran from the back of the house to the top of the garden and also a parallel strip that ran down the side of the house. Half way up the garden, on the right hand side of the central path, was a small green house with a wooden door. I was adjacent to the green house that day when I suddenly heard an aircraft. At that moment, I had no idea where it was, but fearing it was "the hun" (yes, we still worried about this possibility), perhaps a Junkers, maybe a Messerschmidt, who knows, I hid behind that flimsy wooden door. This would have offered no sort of protection whatsoever, but at the time that didn't seem to matter; if I couldn't see the pilot, he couldn't see me therefore he would probably fly on. Peeping out, I noticed over the top of the rising ground to my right a Spitfire, flying very low. Yes, even then, I knew my aircraft. I had obtained those black side-view impressions of all the allied and aggressor aircraft I thought I would likely see at some point. I don't know how I obtained them yet somehow that had happened, possibly by courtesy of the local ARP or Dad's Army, or maybe such posters were displayed in the village hall or somewhere similar. So I knew it was a Spitfire and I then eased myself from my hiding place. There I watched the sheer beauty of this aircraft, its pilot in no hurry to go anywhere particular, he weaving, first left then right as he passed by, eventually disappearing in a slow climb to the left towards the opposite horizon from whence he had come. I was hooked! A couple of years on, with the Radar Reseach Establishment, later Royal RRE not too far away at Pershore airfield, I could journey to see those considerable numbers of experimental types that appeared in the late 40s early 50s. Some of these I had the good fortune to meet up with again when I later transported them to museums whilst based at RAF Bicester in the 1970s. At Pershore, I heard the Fairey Delta 2 break the sound barrier, though from some considerable altitude it has to be said, I watched aircraft like the Avro Ashton, Short Sperrin and many others including variants of Lancasters, Lincolns, early Canberras, etc, often with unusual powerplants fitted. At home, there was the drone of the BEA Dakotas passing overhead ex-Elmdon Airport, glimpses of the Bristol Brabazon on test flights, even the Blackburn Beverley's predecessor, the GAL Universal Freighter. It was a time of much post-war aircraft development - so exciting. That hook began to dig deeper! Then there was school. Our head, Dr Barron had fixed ideas on education and how he deemed his pupils should benefit. Yet I could not see myself ever waiting until I was in the Lower Sixth before taking "O" levels, or waiting further until I was in the Upper Sixth before taking "A" levels. I had a mate, "Chummy" Hodgkins, and he and I eventually decided that we wished to move on; not together, not in the same direction, simply to find our respective futures elsewhere. In the meantime, I had naturally looked into the RAF Recruiting Office and obtained leaflets. I say naturally because those hooks had not let go; I wanted to be around aircraft. I didn't know quite then how I would do this but an airline career seemed out and somehow, the uniform, accomodation, prospects, all appealed AND this all came with a salary. I didn't even speak to my parents about it; I just got on and made arrangements to join the Boy Entrants at Cosford, aged just 15 years, 11 months. hummy and I saw Dr Barron at the same time, that mid-morning, late May 1955. "The Doc" was most put out that anyone should wish to leave his school before he thought they should. But neither of us wished to wait and follow his educational paths (and if I tell you one of my second cousins finally left school aged 22 you might understand my thinking). Had those paths been different there would have been no question; we would have stayed. Yet they weren't. By an odd quirke of fate, two weeks later, though not quite on the day I joined the RAF, Dr Barron had a stroke and died. Chummy and I didn't ever think his death had anything to do with our decisions but, I suppose, you never know about these things. A new head came and the whole ethos of the school changed including when those "O"s and "A"s were taken. Yet it was too late, I was already on the train to RAF Cosford. So, had I been more patient, would I have been the Bank Manager my mother always wished I would become? Heavens No! I was so chuffed to become an 81st RAF brat - I have never regretted the decisions I made, even though I was so young. As it was me that posed the question I suppose I should be the first one to give an answer. I suppose that our generations of boys, born just before or during the war, would be predestined for a career in one of Her Majesty's armed forces, especially as National Service loomed as one approached 18. Of course we of the 81st Entry preferred to jump before being pushed, and we jumped into the RAF. I can lay the blame, if blame there be, squarely on the film "The Way to the Stars." which I remember seeing in a cinema in Notting Hill Gate. (The Roxy - far superior than our local flea pit in Portobello Road). To be honest I can't remember much of the film; I would have been somewhere around ten years old at the time (I know the film came out in 1945 but it would have been a few years later before it arrived in the Roxy). I do recall the theme tune ("Extraordinary how potent cheap music is.!" What does he mean, cheap? We were in the one and nines! ), and a scene set in the Officers' Mess where 'merry' members of the mess march around to the tune "McNamara's Band" with one bloke wearing a lamp shade on his head. That memory has stayed with me until now. However from quite an early age I had determined on the army as my armed force of choice. My father had served in the 8th Hussars ....The Kings Royal Irish Hussars to give them their full title, in which he had enlisted at age of 14 as a trumpeter months before the outbreak of the First World War. He was chucked on the scrap heap in 1924 a result of downsizing the army to reap the benefits of the peace dividend, or the Gedde's Axe as it was dubbed in those more plain speaking times. My father died in 1945 and I have no memory of him other than his regimental cap badge. When I was in the class, known in my school, with its delusion of grandeur, as the Remove I sent off for all the gen pertaining to the Junior Leaders' Regiment of the Royal Armoured Corps, where on graduating after18 months training you were sent to the cavalry regiment of your choice. My step-father, a man for who I had a great respect and admiration, advised me to have an extra string to my bow and also apply to the RAF as an apprentice. He himself had flown in the RAF before the 2nd World War and in the Fleet Air Arm during the 2nd World War, and in fact my brother was already serving in the RAF after training at Cranwell as a radar and radio apprentice (every family has its black sheep). Both the Army and RAF replied and I took entrance exams for both. The RAF were first to call me for an interview, and feeling a bit miffed not to have heard from the pongos I went to Halton and the rest, as they say, is histrionics. Now it could be that my step-father, who probably knew me better than I knew myself, had thought the RAF a better career for me and may have held back the letter from the army, but if I was so keen to join the pongos why didn't I wait a bit longer to hear from them?.... "McNamara's Band" and the bloke with the lampshade on his bonce, that's why. Whatever the reasons for my choice I never regretted it. There were some very rough boys in the army ....and those hairy woollen shirts....oooh! I certainly got a better deal by joining RAF; whether the RAF would reciprocate that statement is best left unanswered. During WW2 my father was an officer in the Royal Observer Corps (ROC). He was, in fact, Commandant No 27 Group ROC in Shrewsbury and as such had access to aircraft and RAF stations that would normally be beyond the view of the average civilian, especially during wartime. The Modus Operandi of the ROC is not widely known. It was to spot and report all aircraft from outposts in their area and to display this info on a plotting table rather like the one in the Uxbridge Fighter Control Centre. All members of the ROC had to be good at aircraft recognition and had to pass a Master Test each year with a minimum of 80%.This was an observation test held in the local Grenada cinema which was commandeered for the day. A constant stream of film clips of a/c in black and white had to be identified and recorded as the clips were shown. In order to prepare for this test there was a pack of cards depicting front view, side view and plan view of both Allied and enemy a/c. My father and I would go through the pack over and over again taking turns as dealer and spotter. In addition, there were a number of Bakelite (Hands up if you remember it! ) model a/c most of which I had to play with. So it can be seen that I was well versed in recognition points of a/c on both sides. On exercise days I would go with my father as he toured the Observer Posts. Each post was sited in a prominent position usually on a hill or high building and consisted of tripod with a flat map of the area and a rotating piece of equipment which could be set to read height and bearing - distance had to be estimated and recognition by the Mk1 eyeball. On a day to day basis my father had to visit RAF stations such as Shawbury and I was introduced to the Link Trainer, dismounted rotatable gun turrets and a/c like a Lincoln designated 'Aries 1', which was the first a/c to fly over the magnetic north pole. When I was about to finish at boarding school in Shropshire where I had to study several subjects I was not interested in and forced to play Rugby, which I hated. Being a round-ball devotee, I tried everything to get a game. Thursday was our class sports afternoon and half the class made up a rugby game leaving the rest to scratch around playing soccer on another rugby pitch, for which you really need a ten foot goalkeeper. As you can imagine I did everything but without success to try to join the 'also-rans' of the academic 'B' Stream who always made up the soccer match. Now from the academic point of view, the immediate attractions of joining the RAF were: a change to a worthwhile apprenticeship in a delightful part of the country, studying things I was interested in, playing as much football as I could possibly want and to get paid as well. There was the small matter of needing to pass a few GC 'O' Level exams to be accepted by the RAF. The year I sat the exams, my school had changed its allegiance to the Cambridge Board. This did not seem to be more of a disadvantage than an advantage because although there were no past papers to use for practice exams it was widely acknowledged the each Examination Board had its own pet subjects and formats. However, when it came to the day of the English Language paper I was delighted to see the list of choices for the main essay contained the very question "If you are going to join the RAF, why would you do so?" The question is "Why did I join the RAF?" Well you can see why it seemed a good idea at the time.